A long time ago a friend and I made seven layer dip together. She changed the way I eat it forever. Her recipe was so delicious I craved it. In honor of Cinco de Mayo, let me share her secrets with you! 1. Mix the refried beans with the taco seasoning and 2 tsps water (if you use unflavored refried beans). If you're using Chili beans mash or blend them with a little extra liquid. 2. Here's Secret #1: REFRY Those Beans! Put the bean mixture in a saucepan and cook at a med-high heat until heated through, cook - stirring constantly another 1-2 minutes. If it gets too dry, add a little bit of water to the mix. The secret is that this brings back so much flavor to the beans and they taste way more fresh! 3. 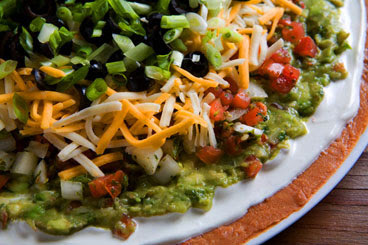 Spread the bean mixture across the bottom of an 8x8 pan - or use your favorite 7 layer dip dish! Refrigerate for 10 minutes to allow to cool. 5. Here's Secret#2: Mix the Cream Cheese and Sour Cream until smooth. You're going to love this! Spread evenly over the bean dip. 5. Cut the Avocado into small pieces, or mash it until softened and spread across the sour cream mixture. Sprinkle with a small amount of Lime Juice. If using Guacamole instead spread the Guacamole over the sour cream mixture and skip the Lime Juice. 6. Dice the Tomato into small pieces and sprinkle over the Avocado. Spread the Salsa over the Tomatoes. 8. Drain the Black Olives. Finely chop the Green Onions and sprinkle the Cheese with Black Olives and Green Onions. 9. Cover and Refrigerate for AT LEAST one hour before serving. The layers need time to set and the flavors to mix. Enjoy with Tortilla chips, or any other preferred method to get it to your mouth! *I understand that some of you may already know these secrets, but for those of you who haven't tried these variations - I urge you to do so. You will be amazed by the difference it makes! always have wondered why canned mashed beans were called refried ???? That looks and sounds delicious. Such a lovely presentation - so colorful.